Elite now offers interchangeable wheels on select bags. Buy one color or get all five. Change them out and pick the color to fit your mood, each one says something different. Get all of them and rotate them whenever you feel! Only the wheels labeled "light-up" actually light up. Hello Von. 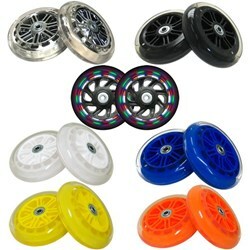 Unfortunately, the light up wheels have been discontinued from our site and are no longer being manufactured. Yes, this will fit the Elite Platinum Triple Roller bag. I have a two ball bag and it always tends to roll over, so I was thinking is it possible to add another wheel on each side to correct this? If so would you be able to supply the extended rods? Unfortunately, we do not sell the extended rods. You would probably need to contact the manufacturer directly. Due to the time it takes to produce the Elite Transparent Wheels ball it will ship in immediately. We cannot ship this ball outside the United States.